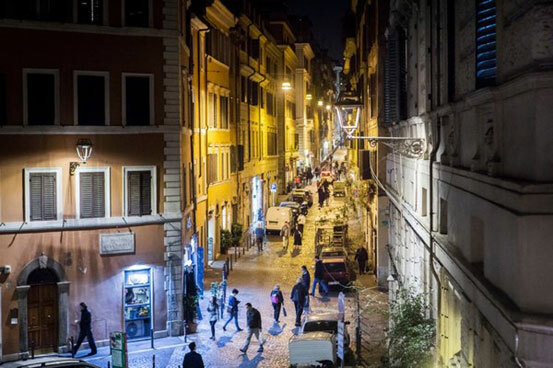 The change of lighting in the city of Rome attracts debates among the citizens. Whether the use of soft golden yellow from a Sodium gas powered lighting or using a rough but bright white light using LED that is energy saving. Bright White LED Lights versus Soft Golden Yellow Sodium gas powered Lights in Rome, March of 2017. Rome was built and was able to evolve for 2700 years and will always develop. Rome always shows signs of design development of city from time to time that no other cities have. Where the beauty of Rome has a nickname: Beloved, Timeless, Romantic, Beauty. “Look over there, at that ‘Virgin and Child,’ with that ugly lamp above it, casting such a harsh outline,” said Nathalie Naim, a municipal council member, pointing to a framed image on a wall. The atmosphere of the Monti village using golden dated gas light. Near the Colosseum, another outrage. “This used to produce a light with a golden halo, that soft and welcoming light that envelops you,” Ms. Naim lamented, nodding to one of the cast-iron lampposts that dot the city center. Alas, no more. Not everyone is bothered, and to some, the switch is more smoke than light. “It’s how you live the city, not the lighting, that makes it romantic,” said Cosimo Barnaba, the salon manager of a hairdresser just off the main square in Monti. The atmosphere in the Monti Village with a Modern LED Light. Creates a huge debate in Social Media. The decision to change the city’s lighting predates the tenure of the mayor, Virginia Raggi, who has had enough troubles on her hands. Nevertheless, since she took office in June, about 100,000 LED lamps have been installed, just over half the number that will be swapped out in the change, costing 48 million euros, or about $52 million, that is expected to save the city millions in electricity bills. A white LED streetlight, left, in Piazza della Madonna dei Monti. The streets in the background still have the old sodium yellow bulbs.